VITAM is situated near to famous Bharabi Temple. From NH-16 (old number NH-5), one has to take a turn at Golanthara Junction towards Bharabi Temple. Just after crossing the temple and going ahead little bit, one will reach the main gate of the campus. The city is well connected by roads and rail network. The Howrah-Bhubaneswar-Vishakhapatnam-Chennai Railway line of South-Eastern Railway/East Coast Railway passes through the city making Berhampur as the busiest station in this region. Berhampur is directly connected to New Delhi, Bangalore, Cuttack, Hyderabad, Mumbai, Nagpur, Pune, Puri, Raipur, Sambalpur and many more cities of India through railways. Hotel Kama's Inn ( → Tatabenz Square, from Railway Station: 1.5 KM). ( For detail information on trains connecting Berhampur from Kolkata (Howrah), Chennai, Hyderabad, Bangalore and other cities- click here ). After coming out from railway Station, one has to book a auto/taxi or can avail public buses to reach the campus via Golanthara / Bharabi Temple. The distance from Railway station to Campus is 22.5 Km and usual charge for an auto from Railway station to the campus gate is Rs.250/-. 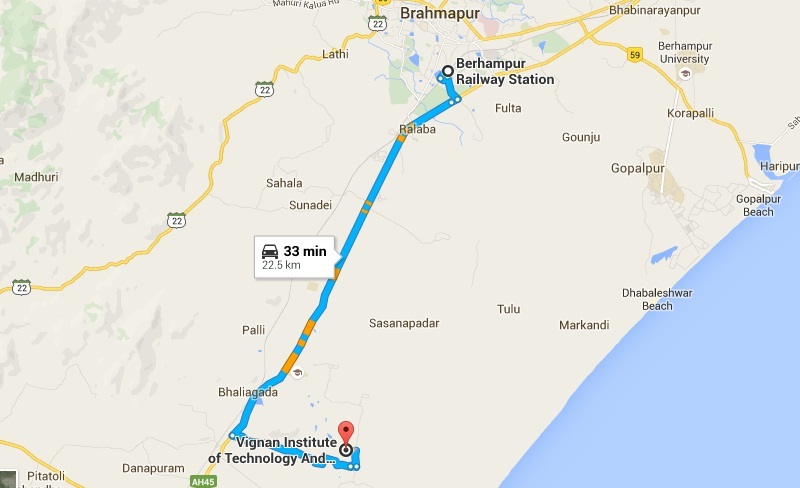 The nearest airports are Biju Patnaik Airport, Bhubaneswar (169 km) and Visakhapatnam Airport, Visakhapatnam (256 km). N.H. 16 (Old No-N.H. 5) runs close to the city providing direct linkage to Kolkata, Bhubaneswar, Vishakhapatnam & Chennai. The city is also well connected with districts through several busiest State highways (S.H.). The State Capital, Bhubaneswar, is situated at a distance of 180 km from the city. It is comfortable to reach Berhampur by roads (N.H.). When someone is travelling in N.H., One has to take a turn in Golanthara Junction to reach the campus.